Hi iOS nation, today is a big day! ALL Readdle apps are getting massive iOS 8 updates: extensions, widgets, adjustments for the new iPhones and much more. And the great news is that all updates are completely FREE! Everything goes live on Sept 17th. Without further ado lets dive into the hottest news our team has prepared for you. Scanner Pro turns your iPhone or iPad into a portable scanner. If you are not familiar with Scanner Pro yet, it is one of the most popular apps on the App Store since 2009, with 6+ million users worldwide. What's new for iOS 8? iOS 8 gives enhances Scanner Pro dramatically in terms of workflow. Now you can scan your photos from Photo Library using Scanner Pro editing extension . How do you do that? Take a picture with Camera app or open any photo from your Photos app. Then tap edit button in the right corner -> tap the round button with dots in the upper left corner to call extensions menu -> pick Scanner Pro extension. Boom! You have a scan now that is cropped and edited. You can also pick color or greyscale filters and adjust contrast and brightness. The cool part is that once you press "Done" this scan is saved in your Photo Library as an edited image, which you can e-mail or upload. Scanner Pro does support iCloud Drive , which means that all your scans will be accessible in iCloud Drive on your Mac, PC, iPad and iPhone. You can now save scans into shared folders with other apps like PDF Expert 5, Printer Pro and others. It is very easy to do. Open Scanner Pro, pick a scan you want to share, then press action button and tap "iCloud Export". You'll see a number of App Containers that you can share with. Simply select one. The whole Scanner Pro app can also be protected with your fingerprint using Apple's Touch ID technology. To activate this go to Settings -> Password Lock -> activate "Use Touch ID". 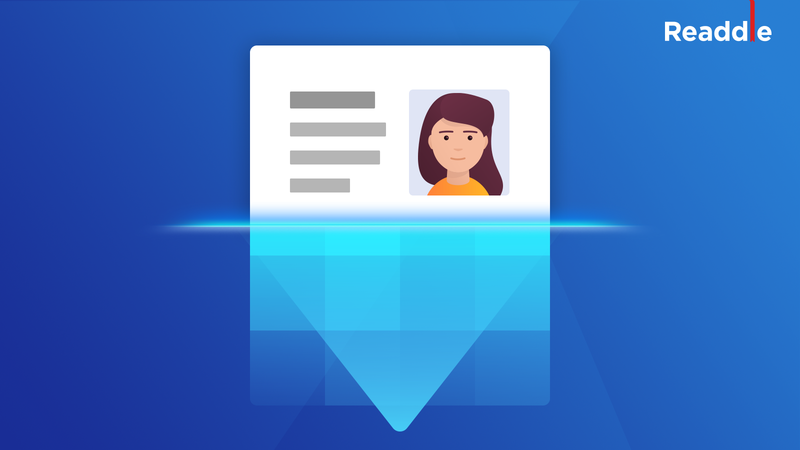 From now on, each time you launch Scanner Pro it will ask you to enter your password or Touch ID. PDF Expert 5 is an ultimate PDF editing and management application. The new update brings new features such as Zoom Writing, AirTurn support, bookmarks management and iOS 8 exclusives. We'll make a separate blog post about PDF Expert 5.2 specific features. Documents is a powerful file manager, document viewer and media player. iOS 8 brings Documents app to the whole new level, since it becomes the main app to view and open your files from iCloud Drive and other apps. Think of it as of the "Finder" app on your iOS device. Let's focus on what iOS 8 brings to PDF Expert 5 and Documents. 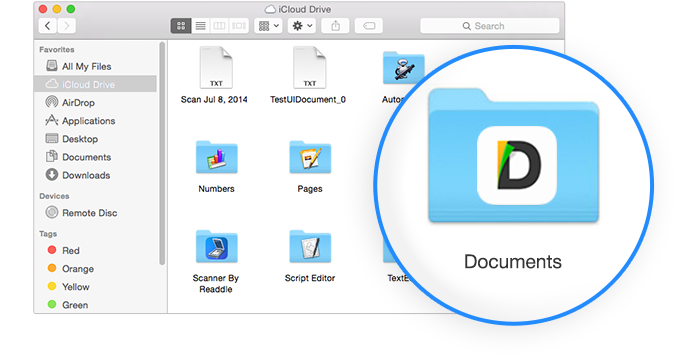 Being file-centric apps, both PDF Expert 5 and Documents benefit big time from the introduction of iCloud Drive . What does it mean for you? 1) Open and view any file from your iCloud Drive. 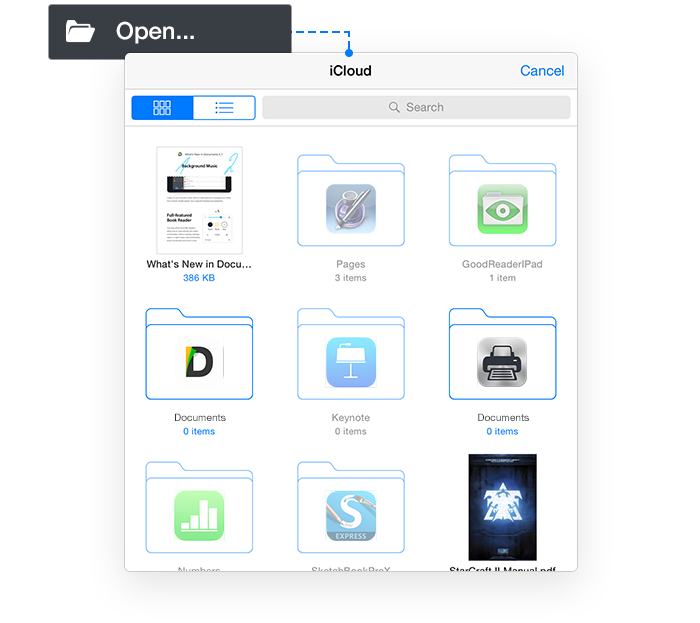 Use "Open" button to view the files that are stored in your iCloud Drive. This works just as any other cloud storage where you have the ability to view files with a single tap. 2) Open and edit files from iCloud Drive and other apps. 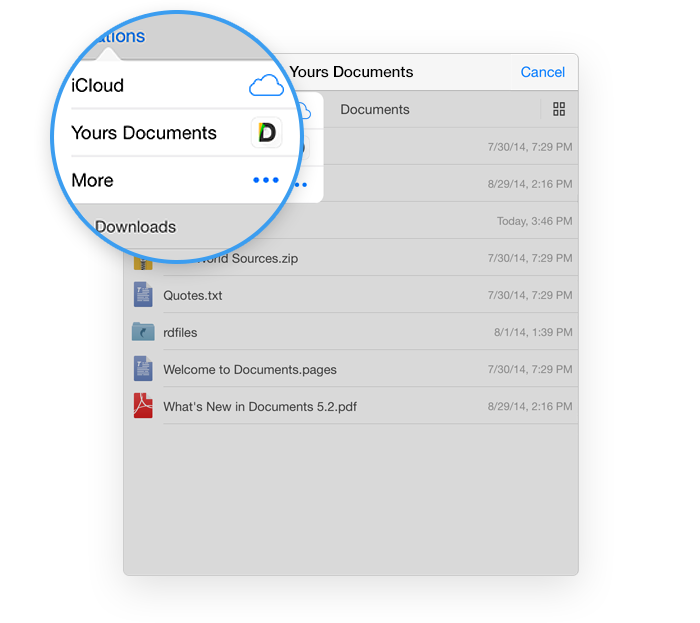 PDF Expert 5 and Documents allow you to open and edit PDFs from iCloud Drive and shared folders of other apps. For example: upload a PDF from your Mac to iCloud Drive, open, edit and annotate it using PDF Expert 5 on your iPhone. You can also switch to PDF Expert 5 for iPad to finish editing on a bigger screen. 3) Move files between folders and apps. File management capabilities of iCloud Drive allow you to move files and documents between apps and iCloud Drive. 4) You can use other iOS apps to open files from Documents or PDF Expert 5. A third-party application should support Document Picker in order to get access to all files that are stored in Documents or PDF Expert 5. Once you are in the iCloud dialogue, tap "Locations" and pick Documents or PDF Expert 5 to access certain files. There are dozens of other use cases that we will cover in the future articles. 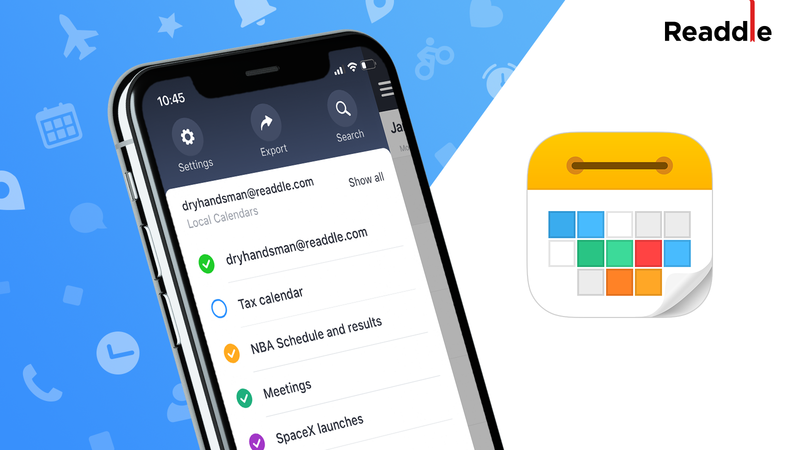 This is a smart calendar app that gets even smarter with iOS 8 widgets! Once you enable the widget, you can view the schedule in Today's View and Notification Center. The new iOS 8 Today View widget makes it much easier to view all upcoming tasks and events at any time. Not only can you view your schedule, but also create new events right from Today's Menu. Notification Center widget allows you to view today's alarms and snooze them. 3. Toggle Calendars 5 on. If you don't know what Printer Pro is — it's a great app for printing wirelessly to any printer right from your iOS device. It has desktop class printing options, so you can print documents the way you want. With iOS 8 Printer Pro gets iCloud Drive support. This essentially means that you can print any document from your iCloud Drive wirelessly. Isn't it amazing? BONUS: In case you already own an iPhone version, make sure to get your bonus iPad compatibility update, as the iPhone version of the app will no longer be supported. To avoid confusion, it will be removed from the App Store as soon as all users get the update. All further versions will be based on the current iPad version of Printer Pro. PDF Converter does one thing but does it well. It converts any file into a PDF, as simple as that. Photos, office documents, e-mail attachments, web-pages and more can be converted in a single click. We've added PDF Converter extension that makes the conversion super easy and fast — be it a web page or multiple photos right from your photo library. Have a look at the video below to see how it works. iCloud Drive is also available, so you can convert any file there into a good looking PDF. We hope that you enjoy all the new stuff we've done! Our team worked day and night to deliver this on the very first day of iOS 8. Yet, we have so many plans on how to make our products even better, smarter, faster. Stay with us. We love you guys.